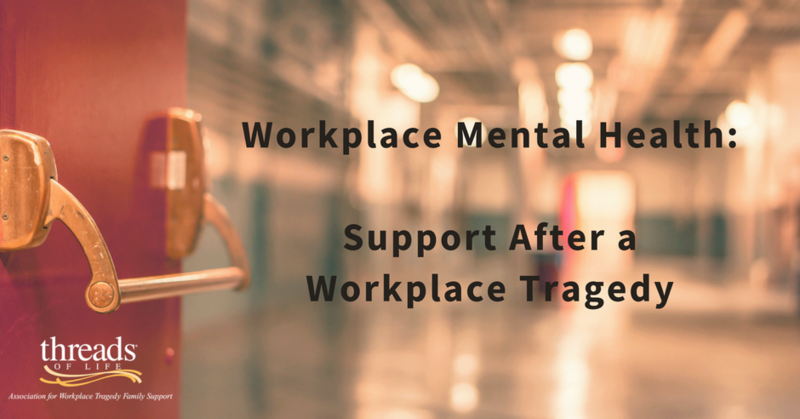 October 10th is World Mental Health Day, and we’re thinking about workplace mental health, as it relates to individuals and families affected by a workplace tragedy. Our family members returning to work after a traumatic workplace fatality. Our family members returning to work after an injury. Our family members working while a loved one is dying of an occupational disease. The mental illnesses they’ve struggled with, both before and after a workplace tragedy erupted in their lives. As adults, most of us spend much of our waking hours at work. The workplace environment can have a positive or negative effect on our overall well-being, and our psychosocial safety has been increasingly recognized by employers as an important aspect of workers’ occupational health and safety. As a society, we’ve made large strides in bringing mental health into the spotlight. And while grief is not a mental illness, the experience of grieving certainly affects us mentally. How we cope with grief and loss affects our mental health. Mental illnesses can also develop in the wake of grief and loss, due to unresolved trauma, a history of mental illness, or a host of other reasons. With more attention than ever before, many brave souls are publicly sharing their experiences by grieving out loud, and sharing their lived experience with mental illnesses such as anxiety and depression, PTSD, and psychological disorders. One by one, they’re chipping away at the deeply ingrained social stigmas attached to their personal suffering, and bringing their voices into the open. We know a little something about that, don’t we? Sharing our voices–even when they shake–is how we’ve shone light on our shared experiences of living in the aftermath of a work-related injury, illness, or death. Over the past 13 years, hundreds of our family members have bravely stepped forward to share their stories as speakers, in our newsletter, and here on our blog. We share our stories with each other at Steps for Life walks and at family forums. Sharing is a core Threads of Life value, and it’s woven through everything we do. Each voice adds to the dimensions of effects and experience; each is a thread in the tapestry of living in and through a workplace tragedy. Collectively, those voices help to remind others, who are–in this very moment–in deep pain: I hear you, I get it, and you’re not alone. We know some of you returned to a very supportive workplace environment, with bosses and co-workers who supported you and accommodated you through the hard times, and contributed greatly to your overall mental wellbeing. We also know that, without the supports needed, some of you have really struggled with returning to work. Some of you have never returned to work at all. What we’d like to know today is: What was the most helpful support your colleagues or boss offered you, or could have offered you, to support you through your loss? Canadian Centre for Occupational Health and Safety – OSH Answers Fact Sheets, Mental Health – Introduction. Sarah Wheelan is the Communications Coordinator for Threads of Life. She has a background in health and safety, and has also been personally affected by a workplace tragedy.